Starbucks Japan have just released their seasonal cherry blossoms selections. This is something that we at Japan Australia look forward to every year. It is a sure tell sign that spring is on its way. The Japan only “sakura” (cherry blossom) food, drinks and goods are a great prelude to the upcoming cherry blossom season in Japan. Japan Travel Advice recently published a Cherry Blossom Forecast for 2015 so we can all start planning our “hanami” parties. This year we have the piping hot Caramel Sakura Chocolate Latte, icy cold Caramel Sakura Chocolate Frappuccino, and Sakura Chiffon Cake to choose from. 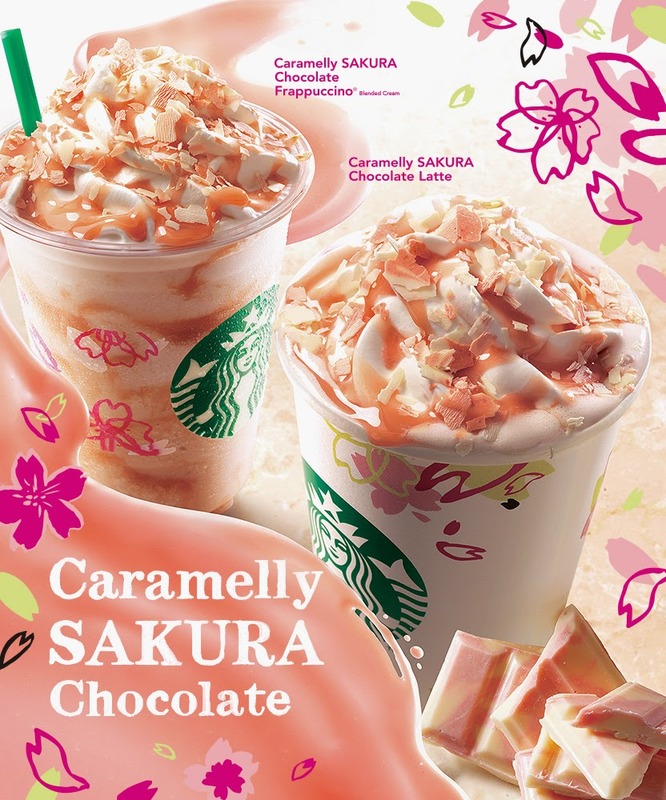 Both the sakura drinks feature a drizzling of rich cherry and caramel sauce and are topped with shavings of cherry-flavored white chocolate. Sounds good doesn’t it? You may remember that last year Starbucks Japan released a Sakura White Chocolate Latte with real sakura petals and leaves as well as a strawberry flavoured topping and pink strawberry infused whipped cream. It was really good! Last year we also wrote about some of our favourite flavours of spring in Japan. 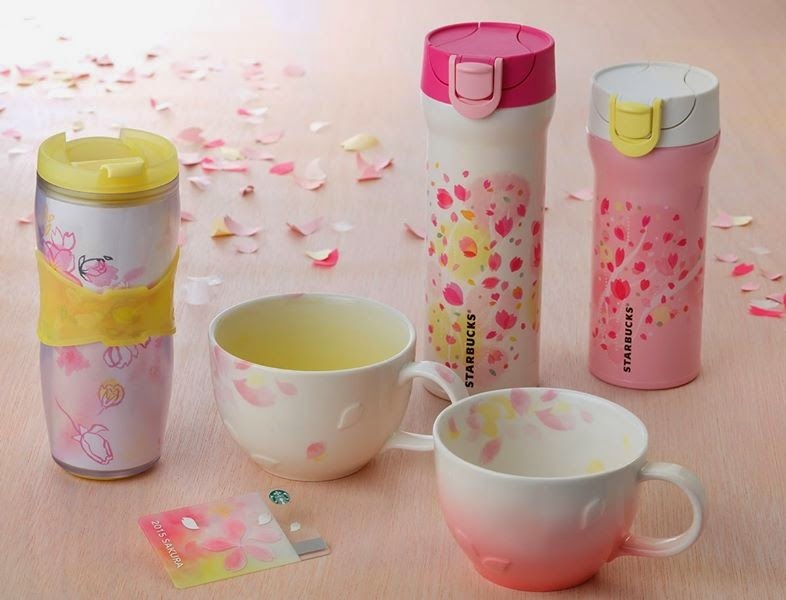 Starbucks Japan shelves will also be stocked with limited edition “Bliss” line sakura themed tumblers, glasses, mugs and gift cards in pale pink and other colours of spring. Around March they are planning to release their “Brilliant” line of products in more vivid hues of hot pink. The cherry blossom selections are available from February 15 for a limited time. Which sakura goodie do you want to try? Forgive my barging in, but I stumbled onto here after reading at Rurousha. As I happen to love both Japan and Australia I need to take a closer look at your blog now. I'm going to Tokyo at the end of March and I hope the sakura will be in full swing - would love to get the Starbucks cups as a souvenir - they're pretty. The cherry blossoms should reach their peak in Tokyo around early April. Unfortunately, the sakura goods sell out quite quickly here so I'm not sure what will be around in March. They will release a new line of products come March in more vivid hues of hot pink, so they might be your best bet.